Civil society has been working to encourage Palestine and Israel to join the ICC for years now. In 2013, our Coalition called on both to join the Court as part of its Campaign for Global Justice. Palestine is the third state from the Middle East and North Africa region to become party to the Statute, following Jordan and Tunisia. 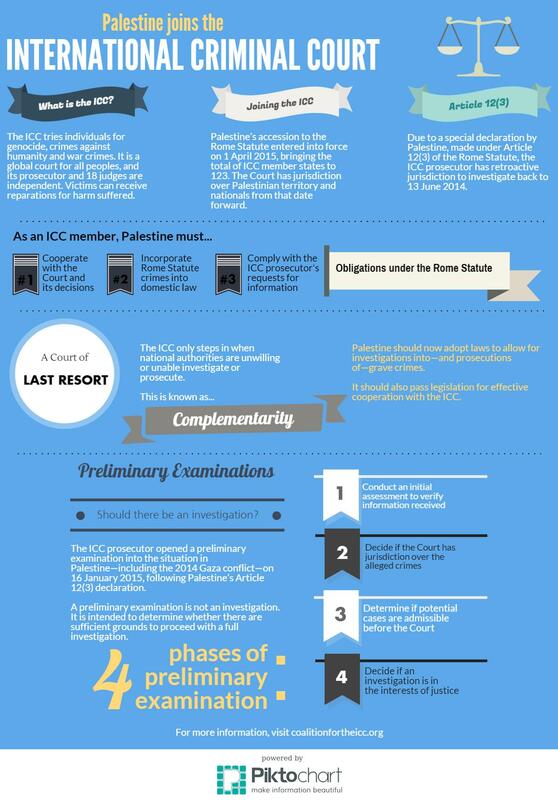 Last December, Palestine made a declaration under Article 12(3) of the Rome Statute retroactively accepting the ICC’s jurisdiction from 13 June 2014. The ICC prosecutor hasopened a preliminary examination to determine whether to proceed with a full investigation into grave crimes allegedly committed during that timeframe. As a state party to the Rome Statute, Palestine can now participate as a member state during sessions of the ICC’s governing body, the Assembly of States Parties, including nominating and voting for judges and other elected Court officials.